condom design focuses on the innovative developments related to the thin rubber latex sheaths worn by a man to protect against sexually transmitted infection, and as a contraceptive; as well as relating to its packaging and products that use the condom in alternative ways, such as in lighting. ingo maurer is one of the most prolific and respected lighting manufacturers and installation design companies, with showrooms in munich and new york. designing high-end luminaires and lighting systems since the 1960s, the company, which is named after its founder, manufactures all its lighting products in-house in the munich studio and distributes them worldwide via a network of selected furniture and lighting stores. how to protect yourself from stupid rules: the euro condom as part of milan design week 09 the german designer ingo maurer unveiled ‘the euro condom’ created in response to new EU guidelines that will see frosted light bulbs banned. 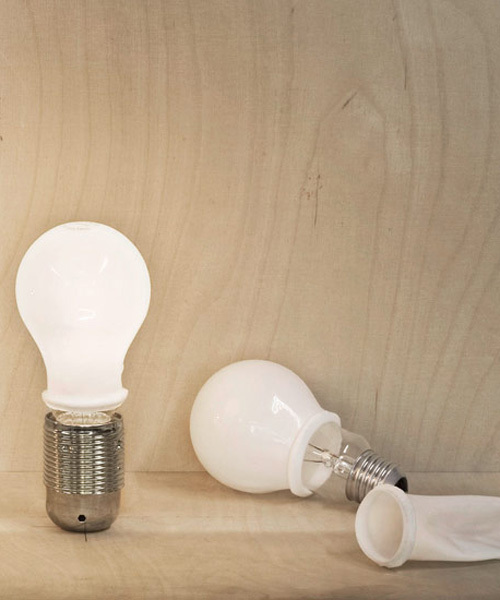 the product consists of a thin, heat-resistant silicone cover that turns a clear bulb into a frosted one. as from september 2009 frosted bulbs will be banned in accordance with new EU guidelines on light sources because they are said give off less light than clear bulbs. however, according to the specifications of various manufacturers the difference, measured in lumens, is negligible or not existent. protect yourself from stupid rules, use the euro condom! is this for real? clear light bulbs are really being banned? That bulb in the picture on the left is beautiful (talking mainly about the industrial end of the bulb) is that a normal bulb in the EU or is it an antique? the world is getting crazy. back to the jungle! how could creativity exist in a world of bureaucracy (EUROPE)? bulbs are so iconic in maurer’s work (the Bulb, lucellino…) that he had to react. he did it with a great sense of humor though. “brilliant” if i may say. Guys, ceejay is partly right, all bulbs above 100W will be banned, BUT also ALL frosted bulbs starting from sept. 1st. I guess this decision has been made to force people to move to CFL bulbs quicker as a clear bulb is not the best choice for many lamps. Besides, I hardly understand the bashing of this EU decision. Sure, the CFL’s are not perfect, but all of us will use LED bulbs in max. 5 years anyway…why would you like to blow 60W when you can get the same light out of 3W? How could creativity exist in a world of global warming? so it’s stupid to ban the frost bulbs first!!!!! Wow, I didn’t know about this rule! It’s funny that all the energy efficient bulbs (fluorescent) are frosted. Love Ingo Maurer’s answer to it though, brilliant! I’ll definitely post it on my blog. Oh! just found this, I think it answers all the above questions!